The Himalayas offer an endless variety of landscapes, cultures and great people. This unbounded diversity makes it a destination you can visit over and over again. It even becomes more interesting and fascinating with every time you return. After trekking in central Nepal a few times I am now eager to explore its west, a relatively untouched area north of the Dhaulagiri massif between Dolpo and Mustang. I got the idea on last year's trek to Mustang (1998) when I saw the small trail branching off near Kagbeni, leading up a mountain flank and soon disappearing. My curiosity grew even more by answers to my questions - 'it goes to Dolpo; very difficult and far away; no tourists'. What started as a fancy became more and more solid after reading and hearing about Dolpo. Finding information proved difficult, but once I got to know the right people organizing was smooth and went quickly. To be quite honest, I did feel a bit nervous before the trek. I was organizing it and responsible for our 'mini-group'. It was also by far the most strenuous trek I have ever done. Our starting point is Juphal, a small village with an even smaller airstrip. After some days in dense forests we will reach Ringmo. The village lies admidst lush fields near the beautiful Phoksumdo lake. From there we continue northwards along the lake, after crossing the first pass over 5'000 m (17'000 feet) the scenery changes all of a sudden and we are in Inner Dolpo. A horseshoe of high mountains incloses the area, endless barren hills and ranges dominate the landscape. After visiting Shey gompa we turn south again towards the Tarap valley where we will find wide golden barley fields instead of desolate deserts. 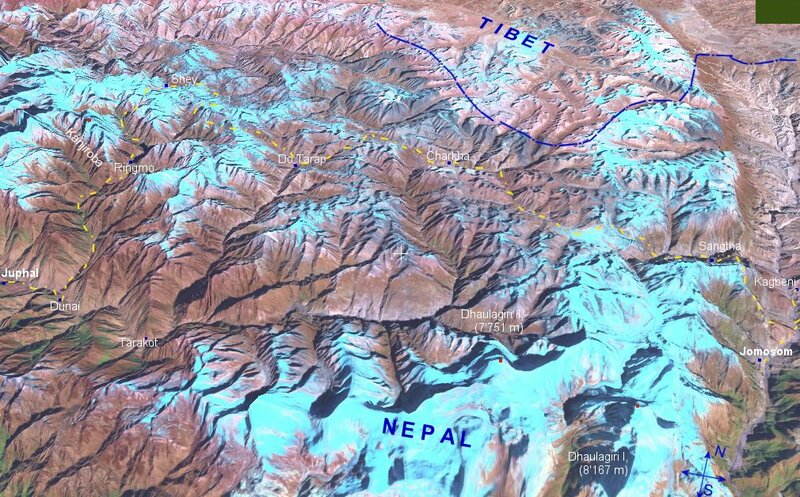 From Do we try to get to Kagbeni, which will probably be the most difficult part of the journey. Apart from two villages the area is uninhabited and wild, trails are often non-existant, bridges are missing and camp sites not easy to find. Much of Dolpo's past will probably never be known. According to legends the hidden land Be-yül was discovered by Padmasambhava, a famous Indian scholar who travelled through the Himalayas to spread Buddha?s teachings. It is assumed that people of Tibetan origin settled down in the area two thousand years ago. They had cultural and economical ties with Tibet and the Lo kingdom in the east. The kings of Lo governed it until the end of the 18th century. When the Gorkhas took control over Nepal, Dolpo gained larger autonomy because the influence of Mustang was reduced. But due to the isolation it suffered culturally and most likely also economically. 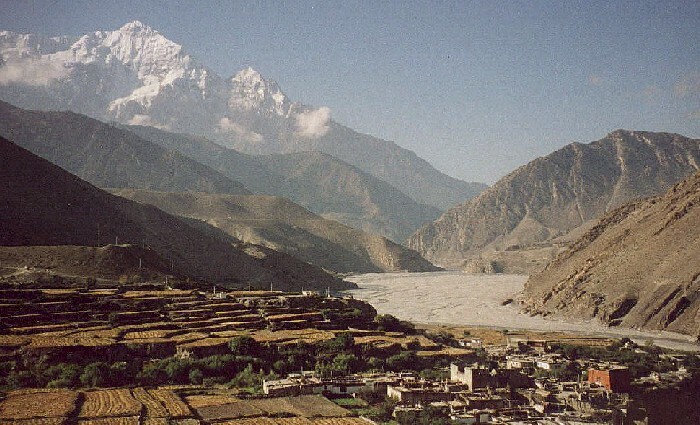 When modern Nepal was founded, only little changed in Dolpo because the government in Kathmandu was far away and not very interested in the region. China's occupation of Tibet in the late 1950s made life even more difficult. All of sudden the winter grazing grounds were closed off, husbandry became very difficult because the meadows in the valleys in the south were not as good. The Khampas, armed Tibetan resistance fighters, settled down on the Nepali side of the border and launched skirmishes on the Chinese invaders from there. There was was not enough fertile land to supply all the people and their animals which were suddenly living in the area. Foreigners have 'discovered' Dolpo only recently. A Japanese monk, Ekai Kawaguchi, was probably the first but he was just passing through on his way to Tibet around 1890. Only a handful foreigners visited Dolpo in the following sixty years. Even after the opening for tourism ten years ago it remains relatively untouched. It is still a restricted area and high visa fees keep away many tourists, the costs are increased further by the lack of infrastructure. If you are interested in the route described in here, please consider that snow can make passes uncrossable as early as October. We started at the end of August and had some expected post-monsoon rain, but this was rewarded by green fields and lush vegetation. Since it takes about 23 walking days (6-8 hours a day), make sure you are in good shape. You will spend most of the time above 3'500 metres and cross six passes above 5'000 m, but technically the hiking is easy. Upper Dolpo is difficult to reach and very arid. Few people live in the harsh climate. They are farmers, traders and shepherds - often all in one because this is the only way to survive. Agriculture on a large scale is impossible because fertile land is scarce. 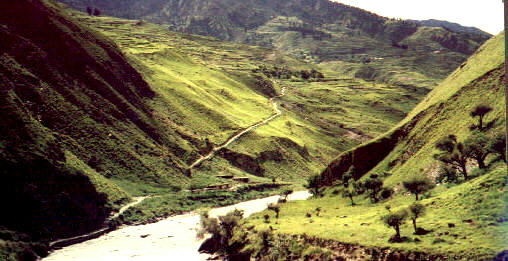 In the southern parts of Dolpo one finds a varied vegetation, farmers can plant a large variety of fruit, vegetables and grain. This contrast will probably have an effect on the culture and the people themselves, and the different landscapes will make our trip even more interesting. Please note: I tried to make the description of the following three weeks as accurate and correct as possible. I received the information from locals, our guides or out of books. Undoubtedly, there will still be some mistakes for which I apologize. Acknowledgements: Thanks to Jamie McGuinness (www.project-himalaya.com), who helped preparations and found an experienced and relieable trekking agency. Also many thanks to Dawa, Pasang, Meena, Sonam and the rest of the crew from Sherpa Society for running the whole trek perfectly.